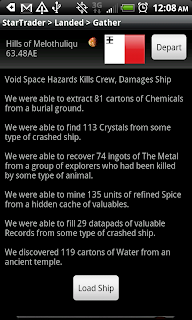 The Copy Captain Feature is found under the "Roster" in the Star Traders RPG Elite game. You can use it to play your existing Captains from Star Traders RPG in Star Traders RPG Elite. Saved Games! I can start a game on Crazy or Hard in "Star Traders RPG" and get to Level 5. I like my ship and he's in a good spot, a starting point. I Copy Captain him to Elite and he goes off on a wild adventure and dies at level 10. Usually it is the Narvidians, I can't help myself the ships have 1000 Artifacts on them. I delete him in Elite (or don't) and make another living copy of him at level 5, the same one from Star Traders RPG, and keep playing on Elite again. I could even go back and try to level him up to Level 10 in RPG before I copied him to Elite. But then if I died in RPG I couldn't copy him anymore. Elite won't copy my captain from free version. I have both free and elite installed and it says that there are no captains found from the free version. I open up the free version again and the file works fine so there's no corruption there. This feature is currently not functioning in the Amazon version. I am uploading an update tonight. Update is not showing on Amazon. Any news?